2+ months can feel like a long time to stick with something, but it will be worth it if it betters your mental and physical health. People that write down their goals and put them somewhere where they will regularly see them are 60% more likely to accomplish them! It is important to set yourself goals that are attainable and something you find exciting. I personally set myself short and long-term goals for business, my diet, and my lifestyle. We all have bad habits we want to to break and things we would love to accomplish. Writing down what I want to accomplish and taking the time to visualize how I am going to see the results has helped me immensely. Are you ready to be a goal getter? Remember to check in with yourself and make sure to hold yourself accountable by telling friends, family, and coworkers about what you have set yourself out to do. 1. Going to bed late. 2. Snacking on junk food. 3. Living a sedentary life. Including more exercise into your routine. 1. Having the TV off by 9:30 pm. Practicing proper sleep hygiene, (no phones, T.V, or tablets in the bedroom), avoiding bright lights, ensuring the bedroom is dark). 2. If feeling the need to snack, snacking on raw veggies or another health enhancing food. 3. To start, including walking for a minimum of 30 minutes a day. 1. Do not start a show or movie that will run past 9:00pm. 2. Prep healthy snacks to have on hand when feeling snacky. Examples: chia pudding, avocado mouse, freezer fudge, whole food popsicles. 3. Track steps with a pedometer or phone app. Try to work your way up to 10,000 steps a day. Check in with yourself. Have you tried incorporating new behaviours to break bad habits? Give yourself a rating out of 5. Continue to check in with yourself and track your progress. After 2 - 3 weeks of implementing new healthy habits repeat the process with 3 new habits. Our brain likes to work in groups of 3. In order to achieve new & healthy habits, focus on incorporating 2-3 goals or repeatable behaviours at a time. If you try and change too many things at once your brain may become overwhelmed. 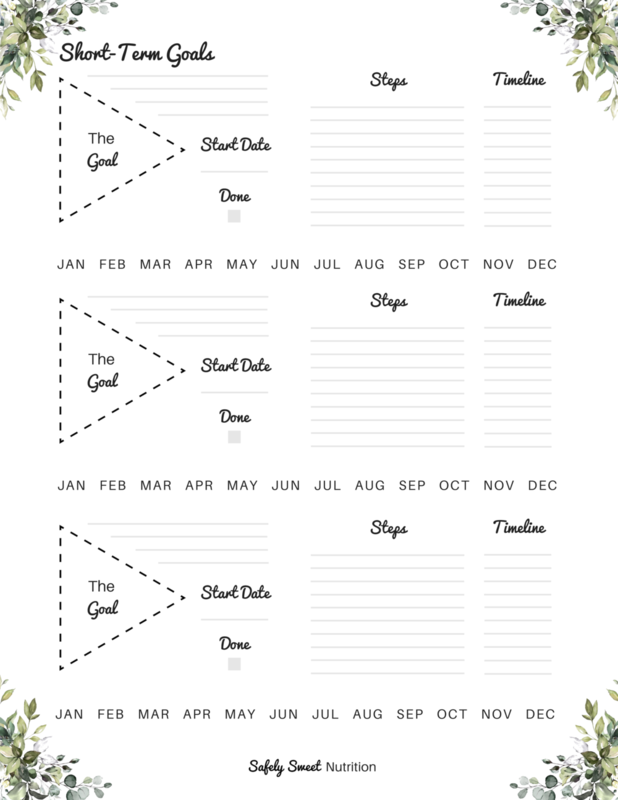 Remember to include the date, the steps you can take to accomplish each goal, and a timeline for yourself. Place your goals somewhere that you will see them everyday. A bathroom mirror, the fridge, in your office. This will help with motivation & accountability.